Rashad Evans believes he knows Jon Jones (Pictured) so well that he decided to publicly reveal his game plan for his friend-turned-foe. However, the reigning light heavyweight king claims much has changed since their time together at Greg Jackson’s famed academy and “Suga” is going to be in for a sweet surprise come UFC 145. “He thinks he knows everything I bring to the table, but a lot has changed since he left the gym a year ago,” Jones recently stated. “I’m a much different fighter than the one he trained with. I hope he is ready to see and feel that difference. 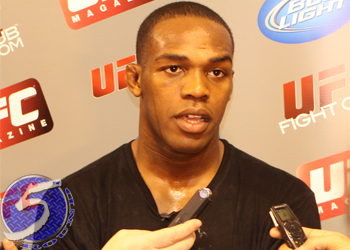 During Jones’ remarkable 2011 campaign, he trounced four opponents, three of which were former title holders, en route to becoming the youngest champ in Octagon history. It was arguably the most masterful year mixed martial arts had ever witnessed. Now 24, still light years away from sniffing the prime of his career, “Bones” is ready to put his accomplishments in his rear-view mirror and continue his ascent up the G.O.A.T. rankings. “I have been able to prove many of my doubters wrong over the course of the last 12 months,” Jones expressed. “Some said I couldn’t submit a legend, and I did that. Some said I couldn’t take a punch, and I did that. Now some are saying that I will have trouble against someone who knows me so well. The bitter rivals will have the opportunity to settle their differences inside Philips Arena in Atlanta, Georgia.